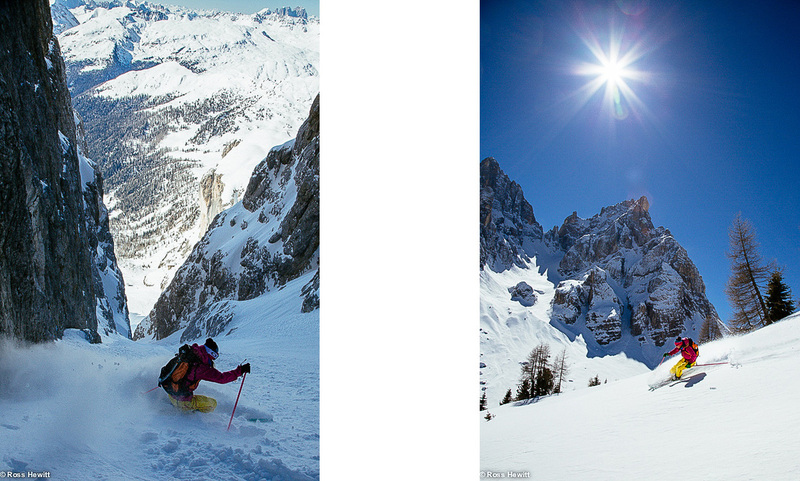 On that last weekend of March, I was supposed to drive 5h away from Chamonix to shoot. The plan was to shoot ski pictures even if the weather was bad. But the weather forecast announced something so bad that you just wanted to run back to your bed and hide under the blanket. The plan A got cancelled… And I didn’t want to go and hide, nice and warm. My stuff was packed in the car and the alarm almost set at 4 am to drive… Now I just needed a plan B and a ski partner… A few messages after Ross Hewitt was preparing his stuff and I promised to pick him up at 4:45! The only place on the Alps where the weather seemed to be ok for the days to come, were the Dolomites. So that is where we would go. Ross had no idea where we were going but I had promised him that if we could find decent cold snow, it would be party time skiing down. We enjoyed some fresh snow on the way down from Passo Rolle to the bottom of the valley. We were mainly swimming up the canale and Ross regretted having left the spanking paddles at home. The thing about having an engineer as a ski partner, is that you learn a lot details. The spanking paddles are one of those… I have the template now to make a pair for me. As we got higher, the snow became more compact and we knew that we could soon enjoy the downhill. Despite the hard work, it felt great to be shuffling in that deep cold snow. It felt like winter again! The first turns after a big climb up in a steep couloir are always interesting. Testing how the snow reacts under the skis, pushing it with your legs, the mind totally concentrated, you give the order to jump and turn. The same routine even though different every turn. I still have butterflys in my stomach each time! The bottom offered more space to open up to freeriding mode as we joined the valley. 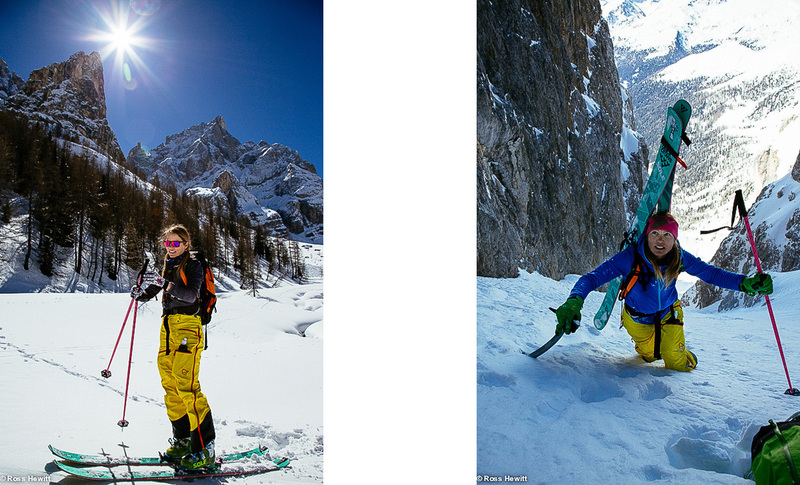 It was spring again in the sun when skinning back up to Passo Rolle to find the car. Happy and tired we drove to Canazei to join friends and share so much desired beer! Next morning it was the summertime clock change… This one is always tough. One precious hour of sleep lost, or 2, when your friend who is in charge of the alarm, forwards it 2 times. I have no idea how it is possible when everything is supposed to be automatic these days… But anyway, the day seemed ideal for a ride to Cortina region. Ross and I had never skied the Cristallo range and we were with friends Tommy Cardelli and Cristian Dallapozza, guides from Canazei with a solid ski style and motivation. There was no wind, the little chairlift seemed deserted by people and so we decided to go ski the canale Vallençant. 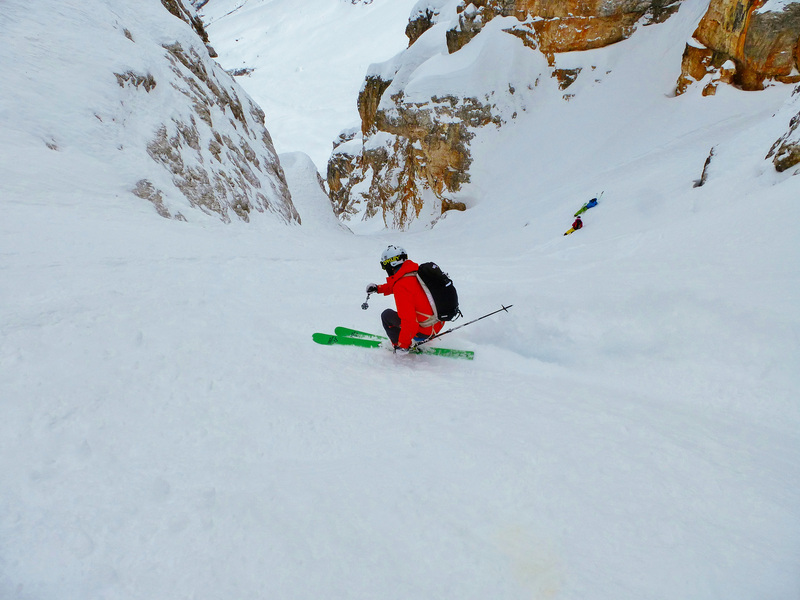 According to the legend, the couloir was skied first time by a local priest. Maybe he went to build a cross on the summit of the ridge and decided to ski down to have some fun! Well, with all my respect, I can’t help myself from laughing when thinking of him with the dark brown long robe making turns in this narrow and steep couloir. Skiing this Vallençant had been on my dream list for years. And I knew I would have butterflies again in my stomach. To acces the canale, there is a via ferrata to do on the ridge line. Wakes you up in the morning for sure! The entrance of this Cristallo pearl is on the left. The snow was perfect, cold and soft, even powder was on the menu! 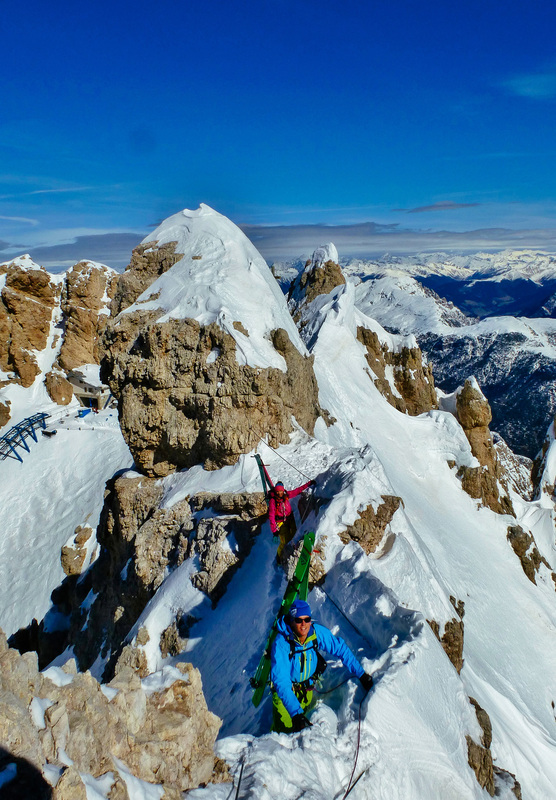 The Cristallo range in Cortina di Ampezzo offers a great potential for couloir skiing with a variable inclination. The Vallençant is right in the middle and all the others are just as magnificient. Afternoon the sky was getting cloudy but we had just the time to catch one of the last cable cars up to Buz di Tofana. To visit. It is a S facing slope, perfect for spring skiing in corn snow. The view and the surrounding scenery are just stunning! For us the snow was a re-frozen crust so all the pleasure was on the view before it disappeared in the clouds. The next day was windy again and the high clouds were rolling in fast. I was thinking of going for a tour in Sass Pordoi range but the navigation on that high plateau requires good visibility. So we opted for the Marmolada and its N face. We bought a ticket for a ride on the basket lift to Pian dei Fiacconi. After saying hello to Guido from the refuge on the top of the lift, it was time to glue the skins back on. My legs were sore from the days before but we got quick to the rythm. Tommy joined us traversing from the top of the Marmolada cable car and we boot packed together to the summit of Punta Penia. The wind was howling on the top, it was hard to keep up straight. It sure felt like winter again! Arctic whiteness, just as I like it. 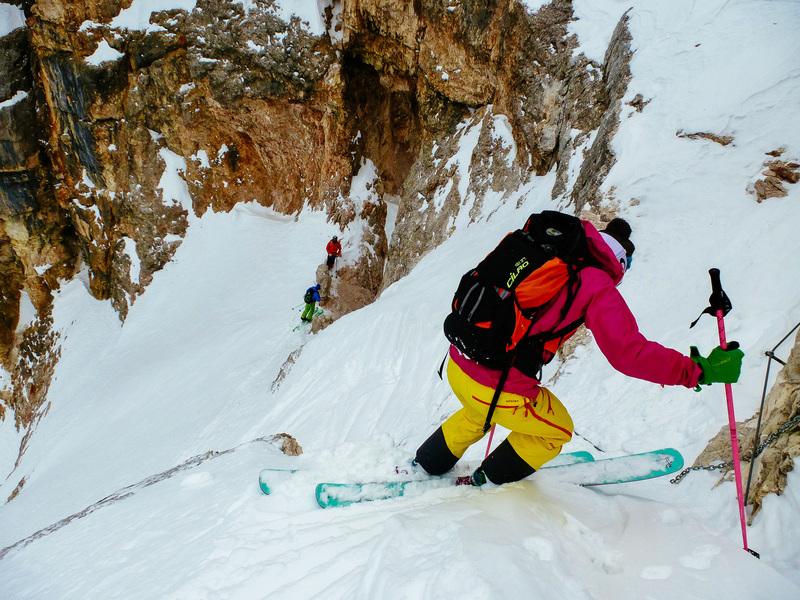 The snow was better than expected and we skied and navigated our way down the NW face of Marmolada, carefully avoiding the icy limestone slabs. Tommy knows his place by heart and it was just great to see how happy he was to show us around. That is all about passion and skiing is a passionate thing.